Verbena bonariensis in the foreground. Another toughie! I love growing this red salvia because it attracts hummingbirds like a magnet. It’s been sitting outside in its container on the deck, because I like to collect the seeds for next year, and it also seeds itself in situ rather nicely. This morning, I awoke to snow on the ground, the result of a nasty storm which is now pummeling us with wind and rain. 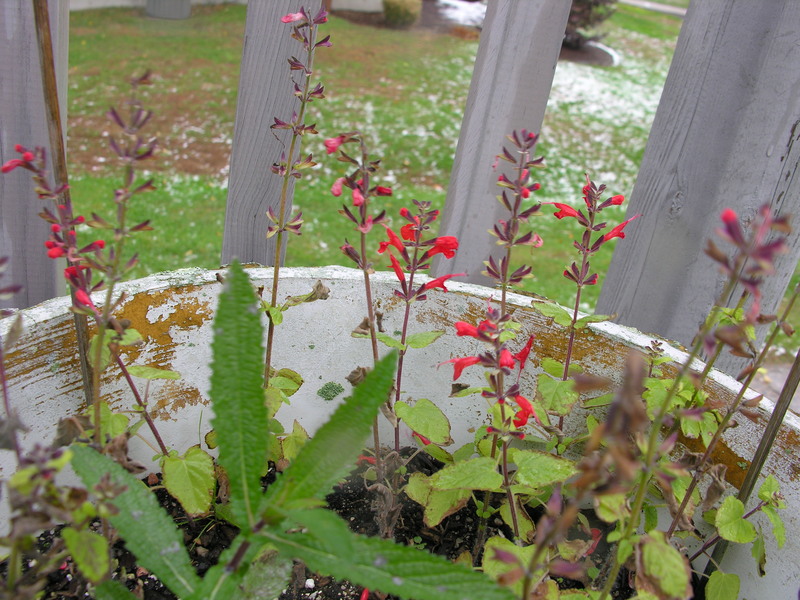 I looked outside as I was having my coffee, and there, being buffeted to and fro, was the salvia, red as ever, defiant in the face of winter! I know it’s only a matter of time before it succumbs, but not today. This is one tough little plant. My salvia is still going too! It sure is tough and reliable. I got some new salvia planted this year. I think it’s pink but is a little looser like your red one looks. I love salvia, both the annual and the perennial cultivars. It’s so attractive to pollinators, and a reliable bloomer besides. I haven’t seen my particular red one at nurseries for the past few years, so I just save the seeds from this one. on the deck. I know that I should bring it in, but it has gotten so large and is so beautiful out there that I hesitate to do so. It tends to like the cool nights to set its bracts and is therefore a late bloomer. It is always in a mixed herb pot with tarragon, parsley and thyme. It will be interesting to see if and when the frost ever hits this area! So you overwinter it? I always let mine die and it seeds itself. I have brought it in dependent on my mood, but it really doesn’t like house conditions at that well. I do love those red bracts though and they sometimes last right through the holidays! That’s why I never bother bringing mine in. It never looks happy for long.